In a previous article (Don Juan: The Greatest Comic Poem in English) I lamented that Byron’s great comic poem Don Juan is not read as widely as it deserves. As the greatest comic poem in the language, Don Juan should have a much wider audience among English-speakers everywhere. Still its fans want to know why the poem is ‘lining portmanteaus’ rather than lying dog-eared on the top of ten million bedside tables. One reason is, probably, “Byron”. 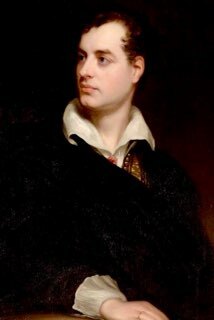 He is still a celebrity: the “Byron meme” remains strong almost two hundred years after his death. But his greatest poem, Don Juan is just not needed to make it work. The shorter poems are much better known because of a sort of happy publishing “accident” that reconstructed Byron’s legacy in the late 19th century that lifted his shorter poetry to the top of the Romantic literary canon, at the expense of his greatest poem. Then the way we consume literature today makes Don Juan harder to consume than it used to be. It is already a long poem. But for most modern readers it will seem even longer. 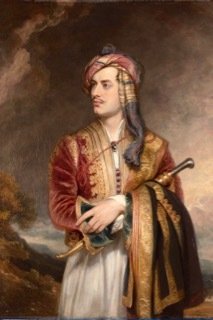 Byron’s celebrity is much more modest than it was in his lifetime: for example in his 20s when fasionable London ‘lionised’ him and (finally) tore him to bits. But it is still solid and, these days, it over-shadows his greatest work. Byron built for himself a striking image with portraits that he commissioned. For exmple: the George Saunders 1807–09 full-length portrait standing beside a beached-dinghey in a navy-blue suit and loose cravat; some miniatures also by Saunders; the idealized Westall profile that many subsequent portraits imitated (not shown), and; two carefully posed portraits by Thomas Phillips. Although second-rate as portraits – compared, for example, to the busts Thorwaldsen or Bartolini made of him – these romantic-classical images were popular for good reason. 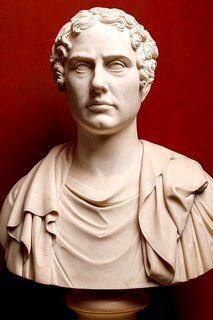 They perfectly fit his high-flown pre–1816 verse, his slightly aristocratic disdain (distant gazes off) and his evident beauty. 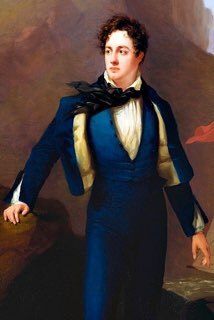 Then, there’s the great tragic jewel of Byron’s post-mortem celebrity: the youth he feared he’d lost when he turned thirty made eternal by his early death in a popular liberal cause. These assets have helped sustain the Byron of popular culture but… It’s a reputation now more louche than literary. Byron as a dangerous, unstable lover; Byron as a rake; Byron as vampire; Byron as the servant-victim of vampires; of Byron as a teddy-bear; Byron as a vampire teddy-bear (just kidding). The prominence of this Byronic “meme” makes it possible, even likely, that modern readers will know him by reputation without knowing anything of his poetic acheivement or his greatest poem. The “accident” that promoted the popularity of Byron’s shorter poetry above that of his longer poems was an influential 1881 edition of Byron’s “selected” poetry edited by Matthew Arnold, poet, critic and Professor of Poetry at Oxford University. Arnold decided that it would aid Byron’s fame – and, incidentally suit Arnold’s publishing project – to make only selections from “the mass of poetry [Byron] poured forth”. Along with scores of Byron’s shorter verse, most from before 1816, he included just 15 brief passages from Don Juan to which he gave suggestive abstract titles. He explained that this editorial approach reflected his similar treatment of Wordsworth in an earlier. Still, Arnold’s choice prevailed. His approach, backed by his new “convenient” edition arbitrated the future for Byron’s fame. 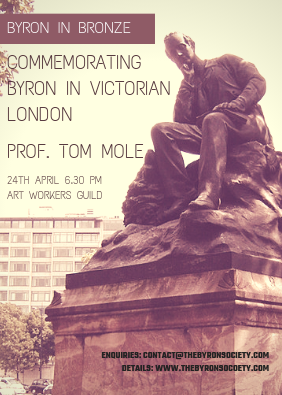 Today, Byron’s poetic impact is reduced to eight or ten partly-understood rhymes (“So we’ll go no more a-roving…”, “Remember thee…”, “She walks in beauty…”, “The Assyrian came down like the wolf on the fold…”). Yet things are getting worse, damnit. As we approach the third century of the poem, Don Juan is effectively growing even longer and, for most people, less accessible. The struggle for popular attention takes many forms but the most successful productions, now, are visual and aural: short videos and “podcasts”. If this is a sign of a post-literate culture, then it’s a bad omen for the encyclopaedic genius of Byron. To be fair, the popularity of streaming media also reflects the time and location most people have available for consumption. We choose to read or listen to music (or play games) in the hours we spend on train, or bus, in their car, at the gym etc. for good reason. This “interstital” time has a lower opportunity-cost; if you’re stuck with the commute anyway, it’s a good time for recreation. Video and audio do not demand the degree of focus that text demands, so they are much better suited to these occasions. Then, long texts — specifically a 20,000-line poem — won’t fit comfortably on the screens of smart-phones that are by far the most common device for digital consumption at those times. Prose text can ‘reflow’ on screen to fit the available width. But verse must retain its format to keep the length, rythm and rhyme of each line. If the line is too long for the width of the screen, ebook readers won’t help by “wrapping” it. The lines of Don Juan are formatted by syllables, not by characters. Many lines that are only a standard ten or eleven syllables are inconveniently long for a small screen (the longest is 193 characters). Unless a tiny font is used, the line must be broken to prevent horizontal scrolling, making it harder to read. Also, a reader cannot ‘scan’ the text of a verse in the way experienced readers scan prose. You can’t skim across the lines picking up key words and phrases. Verse is inherently harder. It takes more effort to navigate the lines and, usually, sub-vocalisation to hear the scansion and rhyme. Byron’s longer poems are fighting an up-hill battle for the popular acclaim they once had and – more than ever – deserve. In the next post, I’ll suggest some ways to redress the balance and to elevate Don Juan to the summit it deserves.